Houses are selling like crazy! If you have been thinking about moving, now is a great time! However, getting ready to move can be overwhelming. Here are some tips to get you headed in the right direction. Set up a special filing system to handle all paperwork related to the move. An accordion file works perfectly for this and is portable. Set up files for the house you are selling, the house you are buying, quotes for various services, etc. Declutter your home. Go through your home room by room and get rid of anything you no longer need (trash, donate or sell). Box us any personal photos or collects you wish to take to the new house so they don’t distract from the features of the house. These can be neatly boxes up in the garage. Stage your home. Spruce up your landscape with some colorful annuals and fresh mulch. Pressure wash or paint the exterior. Give the house a good cleaning, including windows inside and out. Get a new door mat to welcome potential buyers. Get a few fresh decorative items to add a pop to your home. If any of this work seems overwhelming, please contact us at (909)307-4862. We specialize in simplifying moves so that you can reach your goals of getting your house listed and receiving top dollar for it all while getting you ready for your transition. 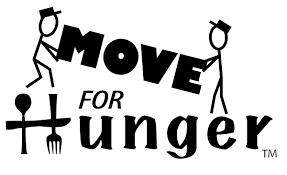 This month when you participate in Move for Hunger by donating unwanted, unexpired food to a local food pantry, we will gladly take it to the charity for you while we are there working with you and give you a 10% discount on your organizing/moving session.